A week or two ago I ordered a Jacob Fleece from Counting Sheep Farm. 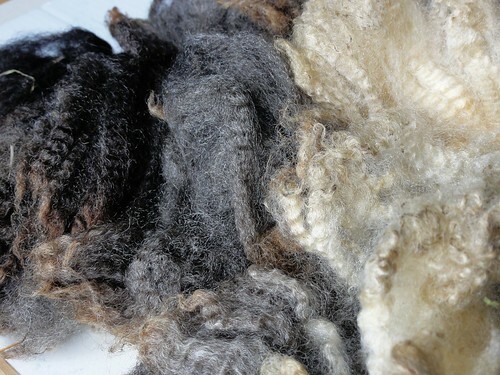 This particular fleece came from a ewe named “Miriam” and is quite lovely. I really didn’t know what to expect, since Jacob sheep are highly variable creatures. 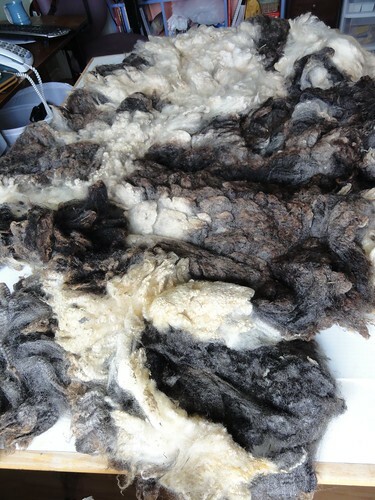 You can end up with what looks like wool from half a dozen different sheep all in the same fleece. The name “Jacob” refers to the biblical story in Genesis, in which Jacob, having married two of Laban’s daughters and had more kids still with their maids (because you could do that thousands of years ago. Arnold Schwarzenegger take note: times have changed! ), takes leave of Laban and heads of to seek his fortune. Laban insists that he take something and Jacob says, okay, give me all your spotted sheep and goats. Laban tries to gyp Jacob by hiding the spotted ones, Jacob pulls some fancy magic with poplar rods near watering holes that caused spotted lambs to be born of solid-coloured sheep. Jabob’s sheep get fat and strong, Laban is foiled and off went Jacob and harem, despite further attempts by Laban and sons to dupe them. Luckily I didn’t have to marry anyone to get this fleece! 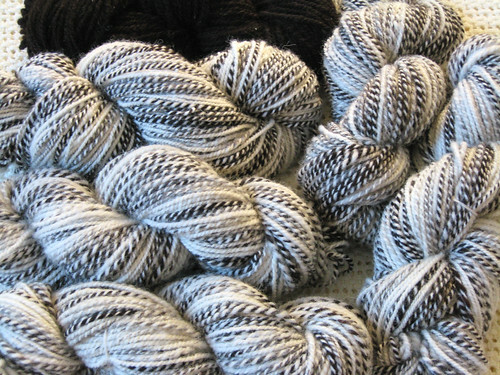 This particular wool is quite lustrous. The white portions are lovely and have a sheen to them. I was also surprised at how soft it is. The photos here show it before washing. At present I have several buckets of hot, soapy fleece soaking and will post some “after” shots. 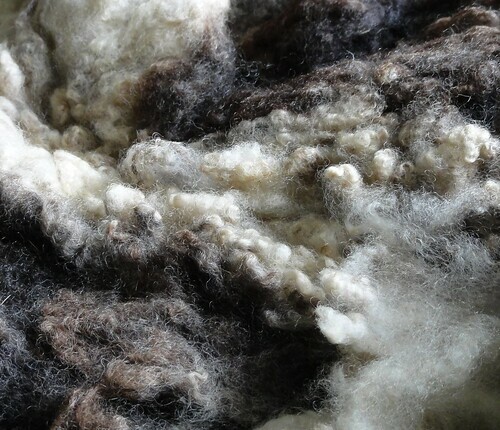 As you can see from my photos, particularly the one below, my fleece has colours that include white, grey, brown, black and shades in-between that almost have a grey-brown or “lilac” feel to them. It’s going to be interesting! Certain parts have more crimp than others, certain portions are curly and some sections are finer. My job for this evening is to sort the portions out, wash them all, and get them drying. Having all those colours in the one fleece makes for interesting possibilities, though. Have a look at this post by YarnHarlot Stephanie Pearl-McPhee in which she shows her Jacob fleece and the resulting gorgeous damask shawl that she spun and knit.